My super sweet sister gifted me this fun bag the other day. I was super thrilled to have a cute and funny tote added to my grab-and-go bag collection as the only other tote I have has the Harry Potter logo on it (not complaining). It got a few compliments on the El this weekend so that's a huge plus! I love getting a chance to talk to strangers, it helps me work on my social skills :3. This weekend was on the chilly side. The windy city took a 180 temperature wise, going from hot summer to chilly, windy, "is it October or something?" weather. It was funny walking outside seeing individuals who forgot to check out the weather channel and wore their short-shorts and floppy hats with over sized sweaters and wool scarves. I did a few layering to beat the chill but forgot that this super flowy dress from Forever XXI is...well..super flowy. I had to hold it down as I walked to avoid having a Marilyn Monroe moment. It got a lot better as the day went on though. haha :). Something I love about this great city is all the gorgeous little spots you find walking in a sea of skyscrapers. As Eamonn and I strutted down Michigan Ave (touristy..I know) I spotted this wonderful church that reminded me so much of my University life in Toronto. 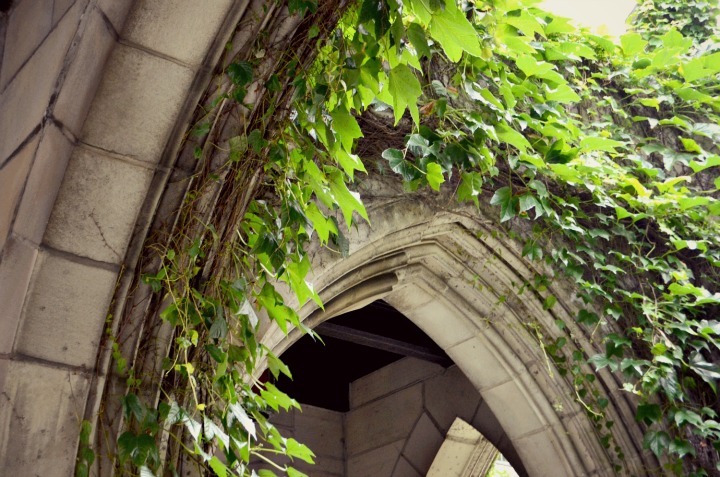 I adore Gothic architecture and vines so I quickly pulled out my Nikon and had him snap a few pictures for me. I think the spot was quite lovely - especially since I was wearing this darling hat from H&M and debuting my new white and cream oxfords. I fear I wont be in downtown anytime soon as this week is full of some more photo-shoots and other work, but it will definitely be missed. I've started packing again for life in Toronto (how has summer gone so quickly?) and I can't help but feel a bit heartbroken. It's been a very bittersweet weekend that's reminded me just how hard saying goodbye to those dear to you really is. 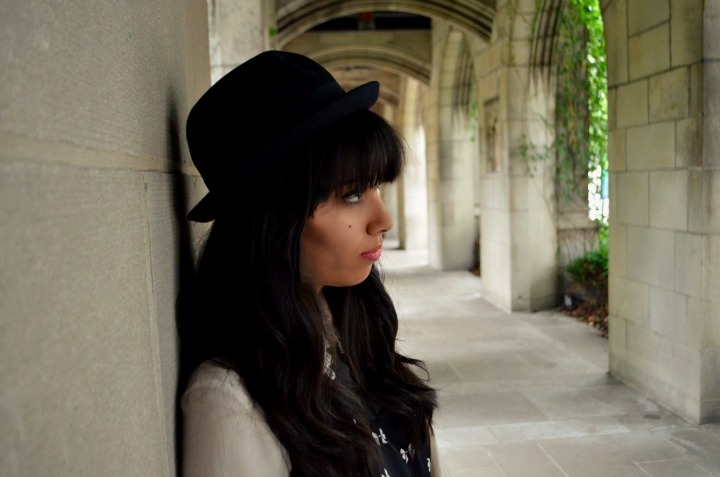 I love your blog its adorable :) Plus I love your fashion style. 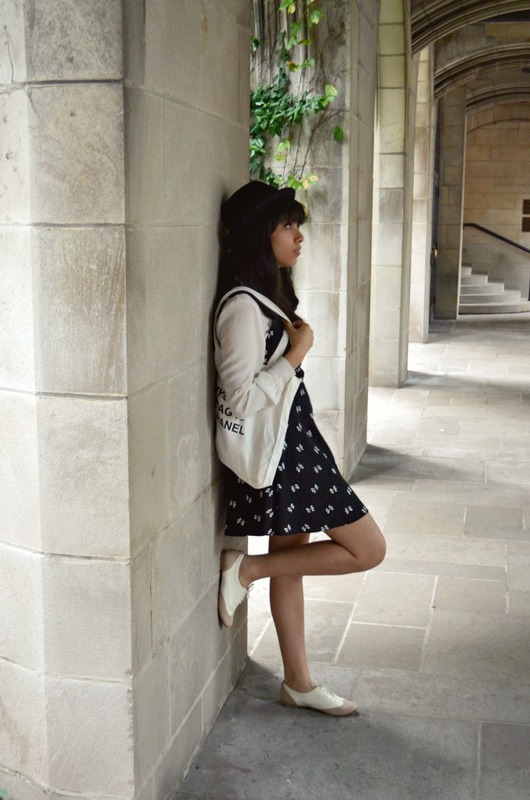 come check out my blog?? Haha that bag is truly awesome! haha, I'm actually one who loves the weird changing patterns of weather... seriously, if I can go through my wardrobe wearing jackets and colorful socks one day, and just a dress the other day, I'm one happy girl. This location is so beautiful! 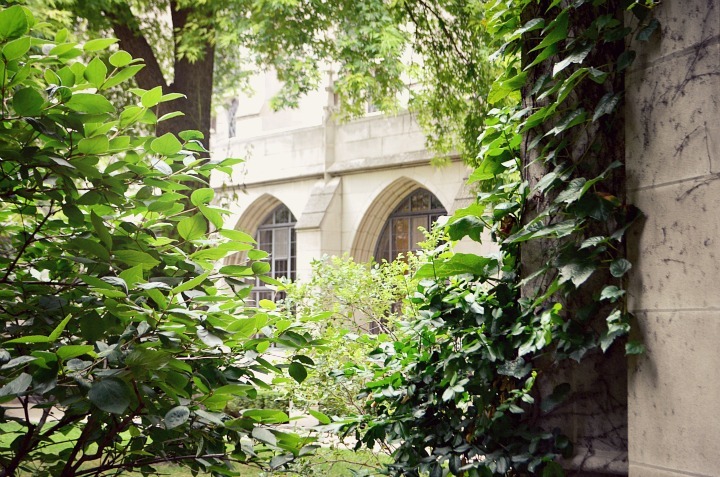 Wow, the greenery and the architecture is just gorgeous. I can't get over that. And adorable dress, too! haha! I prefer slow and steady transition :0).. Thank you! 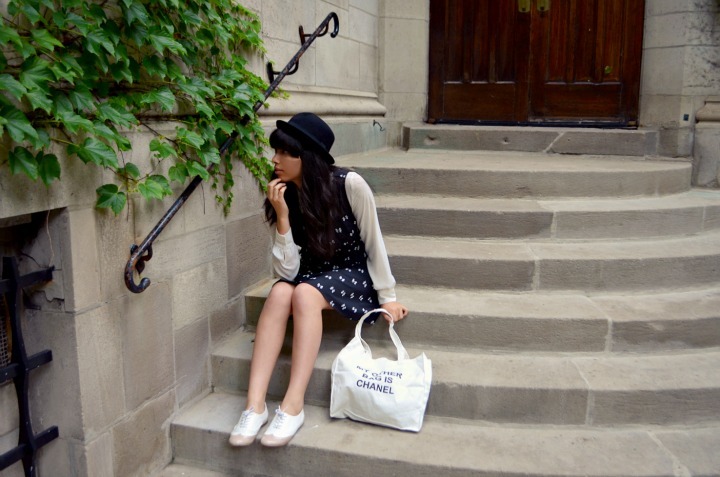 Haha, that cheeky bag is too cute! 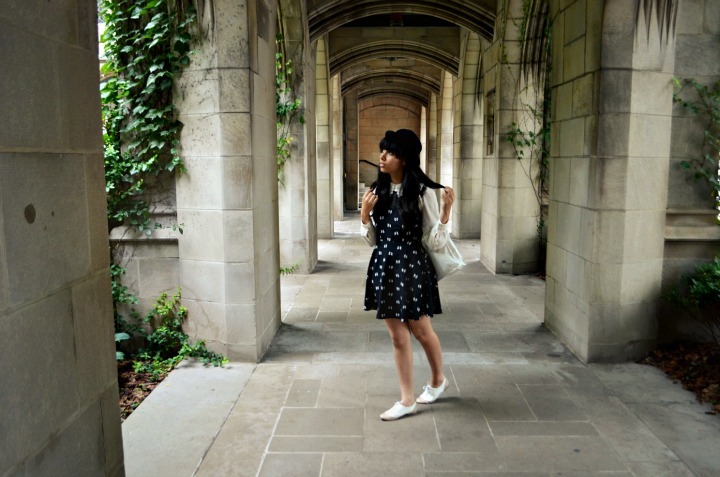 Love the scenery for these photos, the building outdoors is so pretty. thank you so much, Fraish! Haha that bag is awesome!! I love the rest of the outfit too, the hat is adorable! you look so cute! and that bag is hilarious ;) totally know how you feel about leaving those dear to you... I'm down to my last 12 hours of a vacation to asia to see my family. Meep! Love the bag! The scenery is absolutely gorgeous. Obsessrd with this church on Michigan, you should go back there in the winter, the lights would look super cute with your outfits! love this look and that bag is too fun! Cure look! Love the cool bag! Everything about this is adorable! This dress, the shoes, the bag... I want all of this! Such a great outfit and beautiful pictures. Love the whole outfit! It's so cute, especially your shoes! Such a cute outfit! I love the hat and those shoes! You couldn't have picked a cooler place to take pictures, too:) That bag is hilarious, and totally something I would use. Have a great day! What a funny bag! And such a lovely outfit! this outfit is amazing. 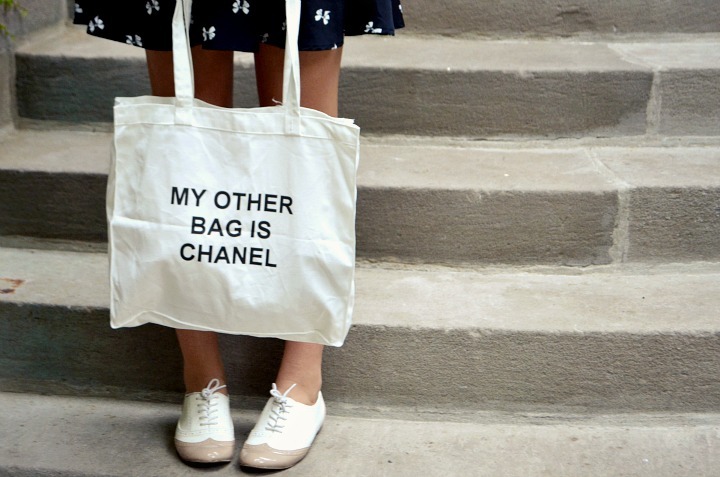 and obsessed with the bag! 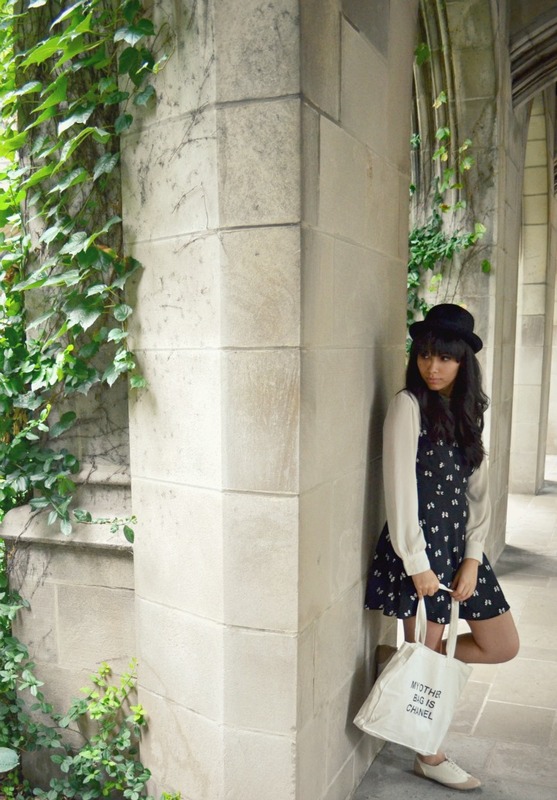 I love this dress and your hat is so dreamy. The weather has been crazy everywhere. What gives?! Not like I mind fall weather in July or anything. And your shoes are amazing! I am dying over that dress and the location of these photos. Absolutely gorgeous! what a perfect picture scenery set! love all these beautiful shots! 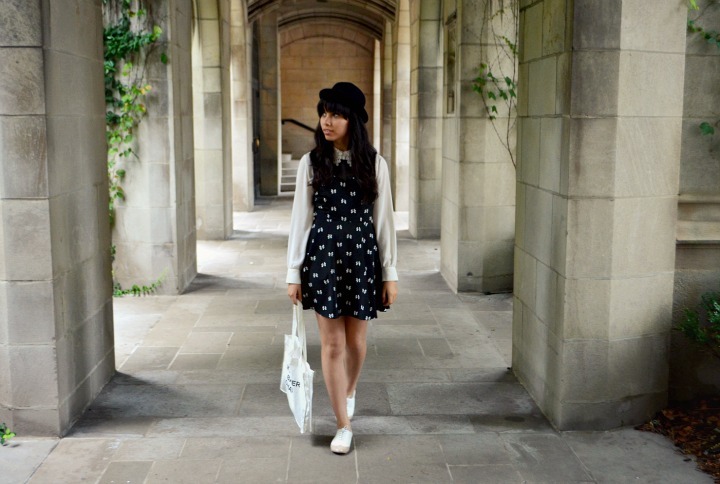 your bowler hat is amazing, and cute dress! I LOVE! Such a cute dress! I love that bag too! !